When a whole theatre laughs at the sincerity of actors as they deliver poor dialogue, you know you're watching a subpar action film. In this prequel to Tokyo Drift, ex-FBI agent Brian O'Conner (Paul Walker), his partner Mia Toretto (Jordana Brewster) and ex-convict Dom Toretto (Vin Diesel) are running from the law. 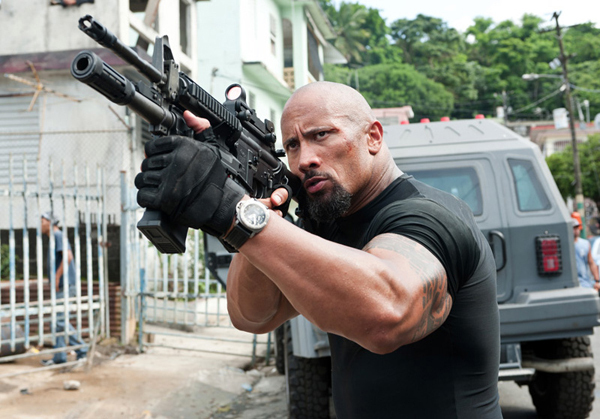 The trio recruits a familia of drivers and thinkers from past films, including Roman (Tyrese Gibson), Tej (Christopher 'Ludacris' Bridges) and Han (Sung Kang) to rob Rio de Janeiro's most notorious drug mogul â€“ Reyes (Joaquim de Almeida). 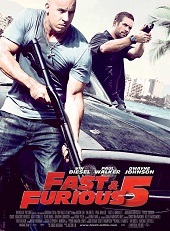 Impatient fans of the Fast and Furious franchise will probably be frustrated by Fast and Furious 5's (titled Fast Five in the US) somewhat slow start, as the standard images and sounds of pimped-up cars, skimpily clad women, and loud urban music are not met until well after the first twenty minutes. So, what happens in the first twenty minutes? We're treated with sweeping aerial views of Rio, a train hijack to obtain sports cars, and an uninteresting parkour-influenced chase scene over the corrugated favela rooftops, as Special Agent Hobbs (Dwayne 'The Rock' Johnson) and co. try to capture our three fugitives. After watching the animated film Rio, it's glad to see the real city on screen and catch a glimpse of the colourful 'Haas and Hahn' art installation. Some of the most intriguing aspects of the film are the sequences in which the lead characters perform sly manoeuvres. For example, Mia and O'Conner are Rio's Bonny and Clyde as they deftly steal a ticket inspector's ID card. Also, the tactics that the familia enact in order to obtain Reyes' money, safely located inside a police station, are ingenious and reminiscent of the looting efforts seen with Clooney and Pitt in Ocean's Eleven. Some parts of the plan will leave you thinking, 'Wow. I would have never thought of that!' And it's also quite cute to see English subtitles, when characters speak Portuguese, rush into the screen from the side, like cars, before speeding off again. However, despite the cleverness of the film, there are also many holes in characterisation and action. For example, among the law enforcement team there is Portuguese translator Elena (Elsa Pataky) who actually does no translating. Also, the climactic fight scene between Hobbs and Dom is more like an excuse for the muscled actors to show off their ruggedness, crashing through doors, walls, tables and windows. The first thing that came to mind was, 'Hobbs angry. Hobbs smash.' Also just as silly is the kiss that Mia and O'Conner share after exiting a sewerage tunnel; apparently, when your partner announces her pregnancy, all sense of hygiene goes down the drain. Furthermore, the lovey-dovey looks between Dom and Elena, towards the end of the film, are highly predictable and scoff-worthy. Fortunately, Tyrese's presence as Roman enlivens the film's atmosphere as he reprises his humorous, fast-talking ways from 2 Fast 2 Furious. He is likeable as usual and one of the few men who can deal with difficult situations without getting cartoonishly aggressive. Paul Walker â€“ we're looking at you. Similarly, 2004 Miss Israel, Gal Godot, is a godsend as Gisele Harabo, the cool, no-nonsense woman who will shoot or castrate any male chauvinist if she had the chance. Thank goodness she is part of the film's cast as she is able to neutralise all excess testosterone in Dom's familia. If you were enamoured by the bromance plot, humour and soundtrack of 2 Fast 2 Furious or captivated by the US-Japanese cross-fertilisation in Tokyo Drift, watching the fifth installment may be a big cine-crime indeed.